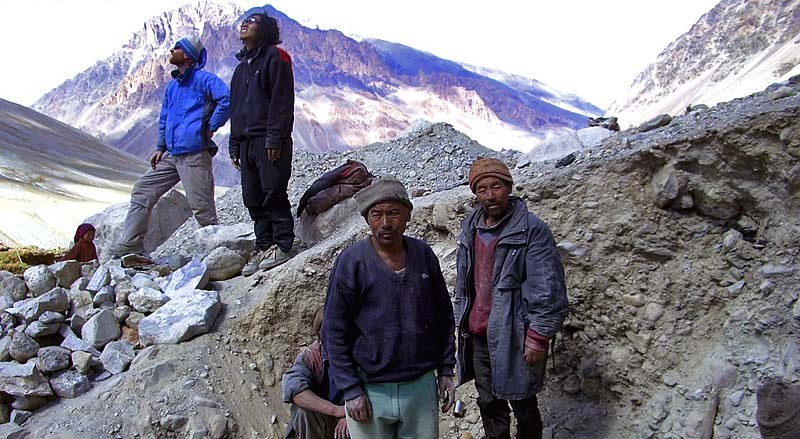 Kargyak is the last village in the Lungnak valley in an altitude of 4200m. 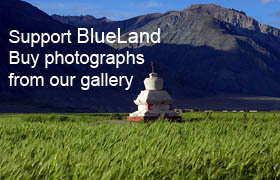 In 2006 The Women’s Association of Kargyak has built, with the help of NGO BlueLand, a unique greenhouse construction. This construction allows for a whole year round harvesting, even in the peak of the cold winter months. In winter 2006 the women harvested spinach, coriander, radishes and lettuce. It was the first time ever that the people of Kargyak could enjoy fresh vegetable in winter. During summer 2007 the women of Kargyak experiment with a great excitement with growing tomatoes, cucumbers, red beat and even strawberries. They are learning how to take care of the greenhouse, how to water it and ventilate properly. 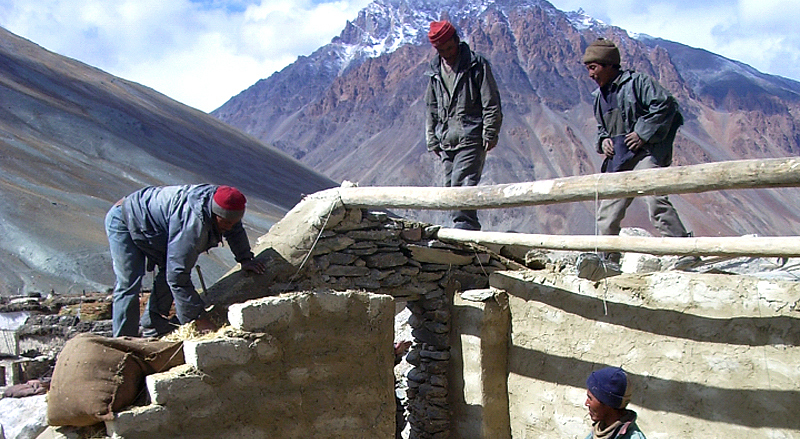 So far The Women Association of Kargyak has done a great job to maintain the highest situated greenhouse in Zanskar. The greenhouse is embedded in a hill, under the Kargyak gompa, with south orientation and just few meters above the irrigating channel. The size of the foundation is 5m x 4m. Back wall of the greenhouse is under the ground level to ensure good isolation. Greenhouse is embedded 30cm under the ground level so maximum of energy can be accumulated. 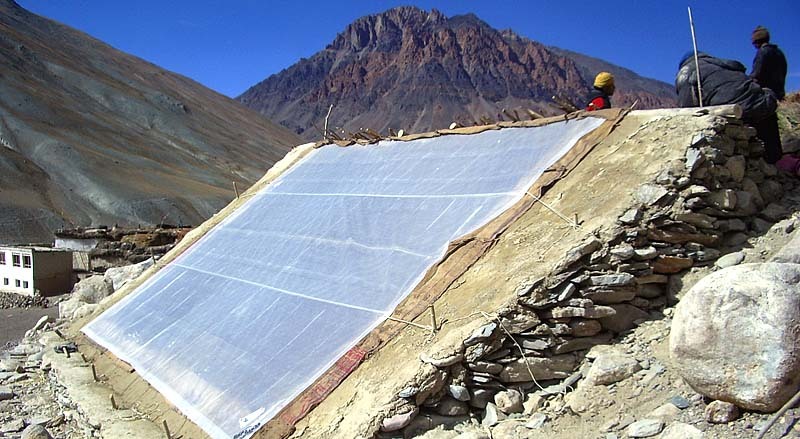 The external wall is 80 cm wide and is sufficient for the cold winter in Zanskar, when the temperature drops to -30 C.
Double wall is made from stones on the outside (external wall) and from mud bricks on the inside (internal wall). The width of the sun dried bricks is 25 cm. Between the stones and the bricks is 20 cm isolation made from barley straw and wood shawings. 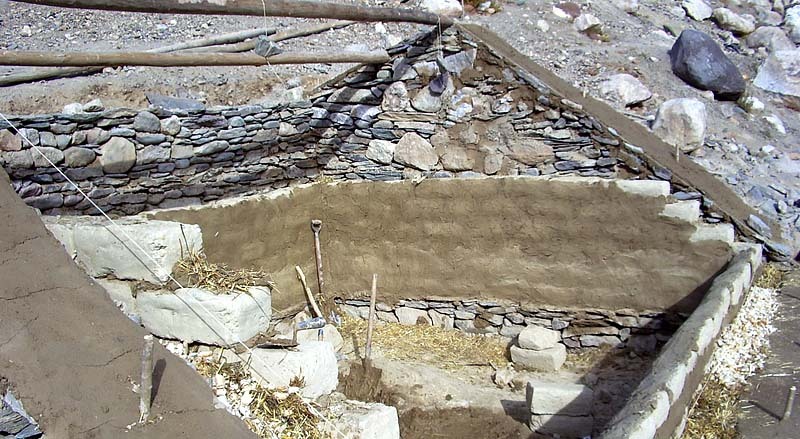 The smooth surface of the wall was done with the use of “kalag”, which is a mixture of soil and water. Two main beams are used for the roof structure. The roof has been built from three layers: “talu” (willow sticks), dry grass with thrones and “kalag” (mud). One window, placed in the roof is used for ventilation during the hot summer days. Plastic sheet is strong and fixed on wooden “talu” sticks which were placed in the base of the external wall. To eliminate the heat leakage we installed double door and used double plastic sheet for the coldest and snowy winter nights. This system works on the principles of energy accumulation. During the day the energy is accumulated and later, during the night, it heats up the greenhouse. East wall is painted white, because the energy from morning light is used directly for the heating of greenhouse. The back and the west walls are painted black, so the energy from evening light is most effectively accumulated. The Women’s Association and Team BlueLand in Kargyak, autumn 2006. The construction was designed and supervised by Eng. Michal Kodym, whose daily help and work on site was inevitable. In spring 2007 The Women’s Association of Kargyak planted their first tomatoes and cucumbers. The plantation was successful and they got abundance of green plants. In June 2007 The Wonen’s Association held, with the assistance of Team BlueLand, Greenhouse Management Workshop. The curiosity of the Kargyak greenhouse is an appearance of three strawberry bushes with the first strawberry harvested in mid of June. Local residents live mainly on agriculture. They grow barley, which they roast, grind and subsequently make into barley flour called "campa" which is the staple food of the local diet. Yields are very small, villagers are using primitive tools and everything is done manually. Since 2006, we strive through training and workshops to help improve methods of local agriculture. We taught local women how to take proper care of their greenhouse, how to compost and fertilize. 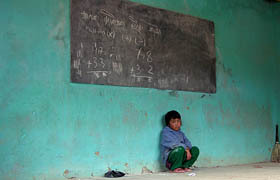 Weintroduced and provided villagers with seeds of new crops and began to educate children. Since 2007 we organize practical summer school for children with a focus on agriculture. 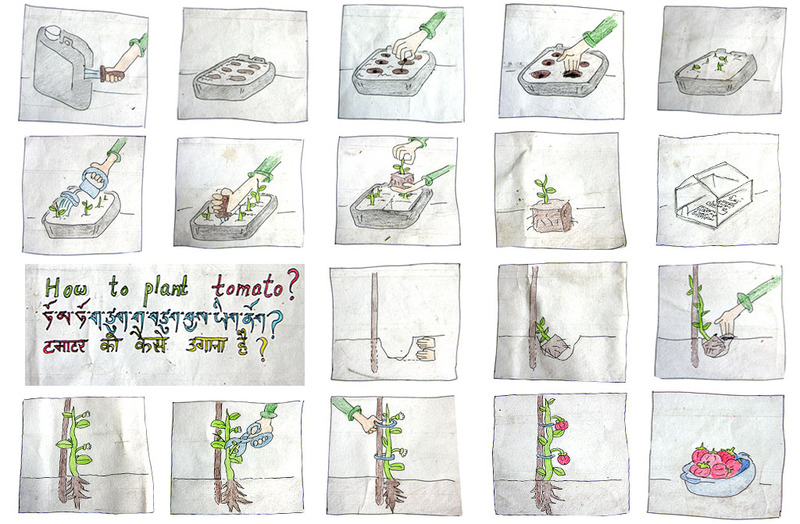 In the next year we are planing to build a new greenhouse for kids and their teachers. Ing.Michal Kodym in cooperation with the Women's Association in Kargyak, autumn 2013.